Don’t Bully My Breed Charity Giveaway with Aicero! Claire is the WAHP behind Aicero, an etsy shop that sells beautiful handcrafted jewelry and baby booties. I interviewed Claire earlier in the year and learned a lot about her! But, she let me know a few new things this time around. All the proceeds from her Etsy shop goes to abused and neglected dogs through the charity Don’t Bully my Breed. Claire is a foster home for the rescued dogs. They are in a contest for an extra $1000 right now and if you help her win then you will get an extra entry into the giveaway! The puppy on the left is her new foster baby! Her name is Maple (aka Miss Sugar Maple Syrup). Claire has some beautiful pieces at her site right now. Many of them would make great Christmas gifts (if you can stop yourself from keeping them!) and they are very affordable. Make sure you do the above entry first so I know what you want! Vote for Don’t Bully my Breed in the $1000 Charity Contest. You can vote every 12 hours so you can get up to THREE extra entries by voting for Don’t Bully my Breed – just leave a comment each time you give them a vote! Leave each entry in a separate comment! The winner will be chosen using Random.org on Thursday December 10th. The winner will have 48 hours to email me with their information in order to claim their prize. 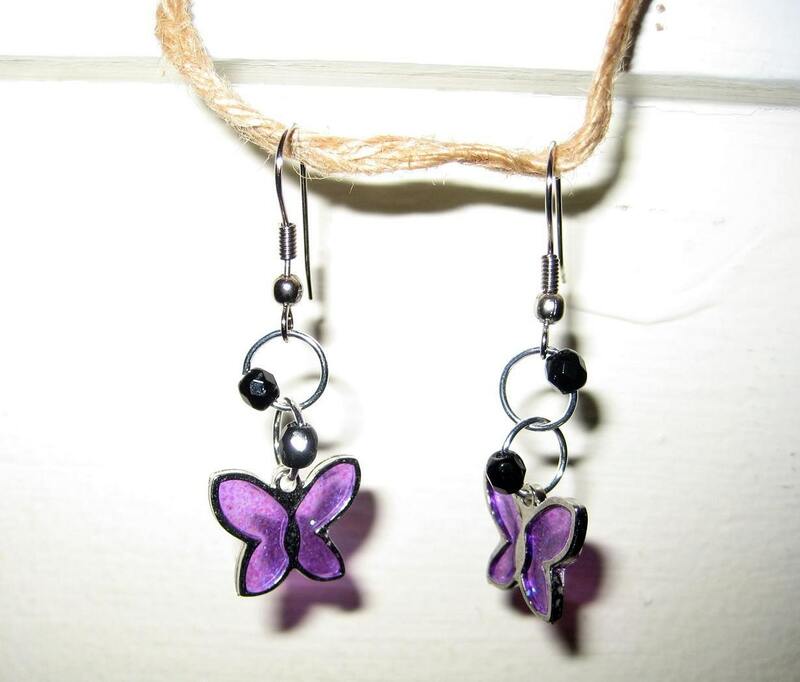 I would love love love the purple glitter stained glass and beaded butterfly earrings, they are super cute. I also like the genuine pearl bracelet, but in a necklace, if she makes it in a necklace, i might be interested in buying one after the holidays. I would like the Amythest and Crystal necklace and earring set. I think I have signed up on all your links and your button is on my blog also. This is pretty and would make a nice gift. Thanks for sharing and offering a nice gift. I LOVE the Amethyst, Aventurine, Hematite, and Austrian Crystal Bracelet and Earring Set!!! I like Genuine Peridot Chip Beaded Bracelet. I love the Amethyst, Aventurine, Hematite, and Austrian Crystal Bracelet and Earring Set! So cute! Hemalite,Australian Crystal Bracelet and Earring set. That is really pretty. Thank you! Next post: Angels on Earth Magazine $3.27/Year – Today Only!